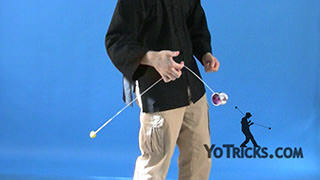 Learn how to do the Drop Trapeze, and ambidextrous 5A repeater trick which teaches an important way to return the counterweight to the hand. 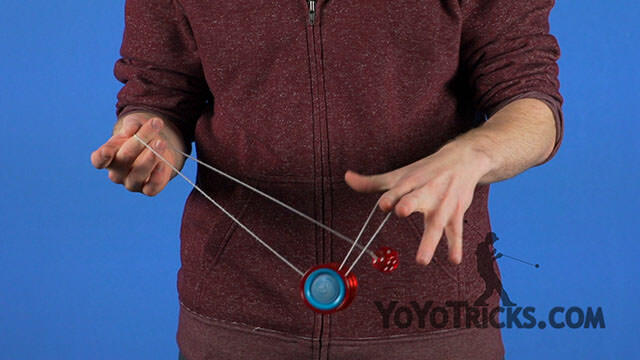 Drop Trapeze builds off one of the tricks in our 5A Fundamentals Series, which is called Switch Trapeze, and it looks like this. 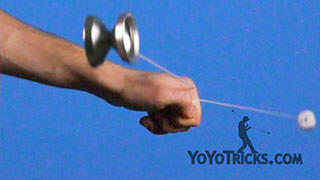 As you can see, during Switch Trapeze the counterweight is never actually free of my hands. All I am ever doing is transferring it from one hand to the other. 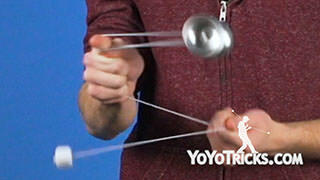 But Drop Trapeze is a bit more of a step up. 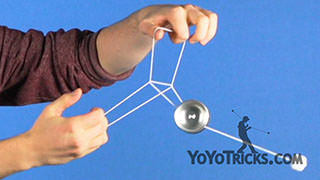 Actually I have to rely on gravity to keep the timing of the trick correct, and the yoyo and the counterweight both have their own momentums, which makes this trick a bit more involved. 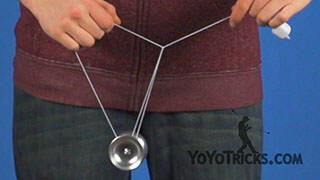 So, to perform Drop Trapeze, first you are going to want to start in a trapeze. 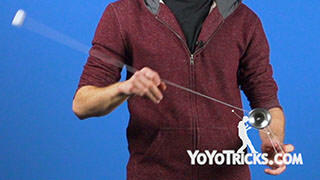 Then just like with any other 5A trick, we are going to check our string proportions. 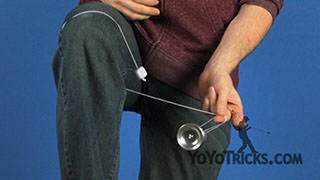 So bring your throwhand up and you want the counterweight string above your hand to be about twice as long as the yoyo string below your hand. Bring your hands apart and then what we are going to do is take all five fingers on our opposite hand and stick them out. So we do not just want only our pointer finger out, instead we want all five fingers out. 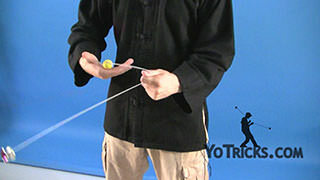 Then we are going to take our pointer finger and our middle finger on our opposite hand and just pinch that string really lightly, it does not have to be a hard pinch. Then we are going to get ready to drop the counterweight. 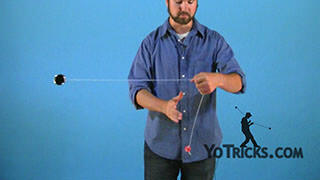 Right after we drop the counterweight, we are going to take our opposite hand and swing the yoyo toward our throwhand side and land the yoyo into a trapeze over our throwhand pointer finger. 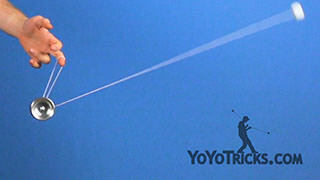 So drop the counterweight, swing over, and land into a trapeze. 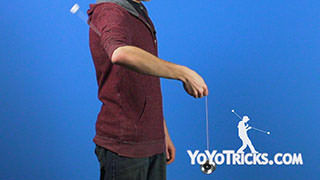 So, we still have this long tail on the counterweight, so how do we get the counterweight to our hand, is by taking our middle finger and our thumb on our opposite hand, making a ring, and then letting the counterweight string slide all the way down so that you can catch the counterweight. So let us go over that one more time. 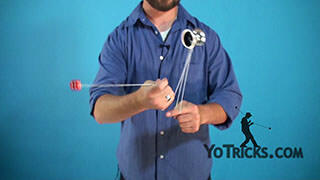 I am going to pinch, drop the counterweight, swing over, land, and then middle finger and thumb come together. You can get your pointer finger out of the way. 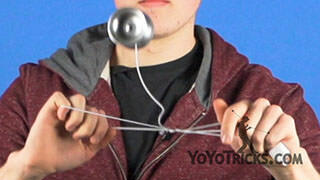 Then let the counterweight string slide all the way down and catch the counterweight. 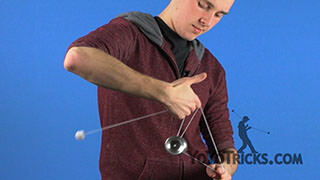 It is going to be just the same thing on the opposite side, so we are going to pinch, drop, swing, catch on another trapeze, and let the counterweight string slide over. 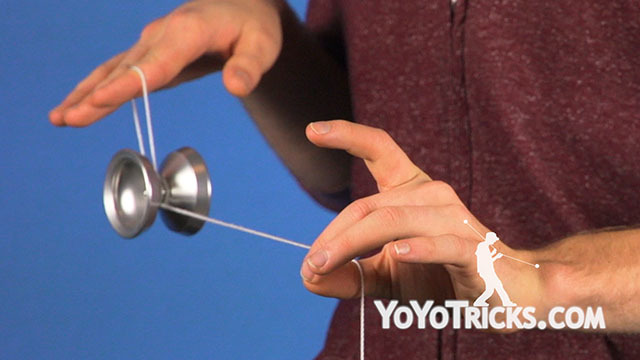 So when you speed that all up and put it all together, you should have the yoyo landing onto the trapeze just about when you catch the counterweight. 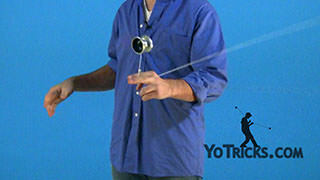 Or the yoyo can land a little before you catch the counterweight. 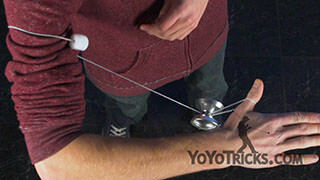 If you are having some trouble with this trick, there are a couple things to keep in mind. 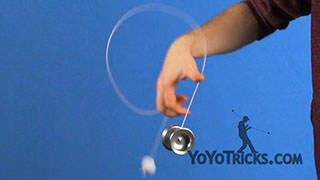 The first is that you do not want to hop the yoyo up. So you do not want to be doing this. 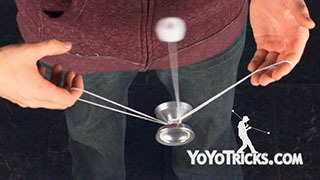 That actually makes the trick more difficult to learn, so you really want to focus on just gently swinging the yoyo and not popping. 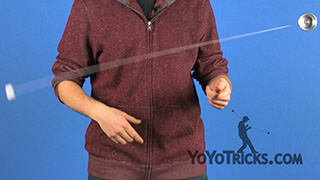 The other thing is that because this is a completely ambidextrous trick, you might find that one side is really smooth, and the other side is actually more difficult. 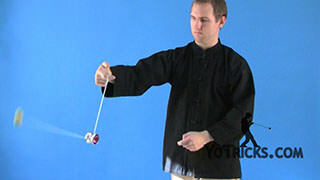 That is just something that you need to adjust to with more practice. 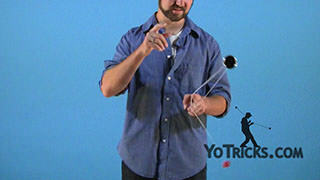 And that is Drop Trapeze.